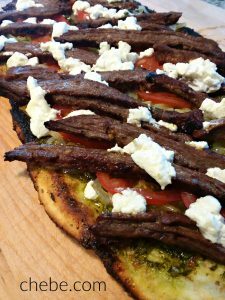 Gaucho Pizza a la Parrilla (on the grill) celebrates the flavor of the Pampas with Argentine-style chimichurri sauce, grilled skirt steak and goat cheese. 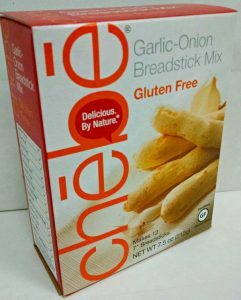 And with Chēbe underneath it all, you have a fantasitc grilled pizza that is gluten and grain free. 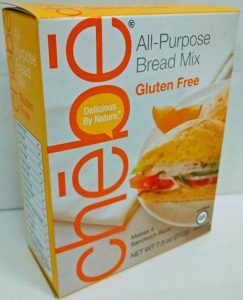 ‘Che’, you just gotta try it! Tenderize both sides of the meat with the tines of a fork. Season both sides with salt and pepper. Lay it out in a wide and shallow glass or ceramic dish. Blend the remaining marinade ingredients in a food processor or blender. Pour over the steak. Turn the steak in the marinade a few times to ensure that all of its surface is covered. Let marinade 6 – 8 hours or overnight. Keep in the refrigerator until ready to grill. Thinly slice the onions and crush/chop the garlic. Pour the oil in a pan and heat on medium high. When hot, add the onions and sauté for a couple minutes, then add the garlic. Continue sautéing until the onions are soft. Set aside. Thinly slice the tomatoes and set aside. Chop the goat cheese into small pieces and set aside. Heat the grill to medium high. Remove the meat from the marinade and grill to your preference. When done, remove, let rest for at least 10 minutes, then slice in thin strips. Set aside. 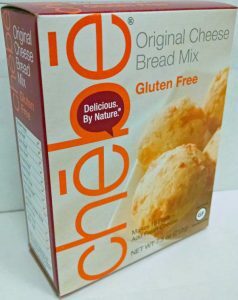 Using a fork, blend the Chebe mix with the cheese. Continue blending in the milk, eggs and oil. Mix for a couple of minutes, then continue kneading with your hands until the dough is smooth and well blended. Flatten/shape the dough with hands until it is between 1/8” and ¼” inch thick. Brush with olive oil. Sprinkle both sides with polenta if desired. With tongs, remove and transfer the half-finished crust to a flat surface (a large cutting board or baking sheet). Close the grill cover and TURN OFF the center or the side burner (see note below on the indirect heating method). 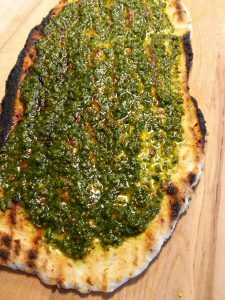 Flip the crust to show the grilled side. 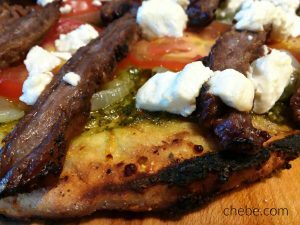 Spread the Chimichurri sauce evenly over the surface, then layer the onion/garlic, the tomatoes, the meat and the goat cheese. Return it to the grill and place it over the burner that is turned off (indirect heat). Close the cover and grill until the bottom is browned (7 to 10 minutes). 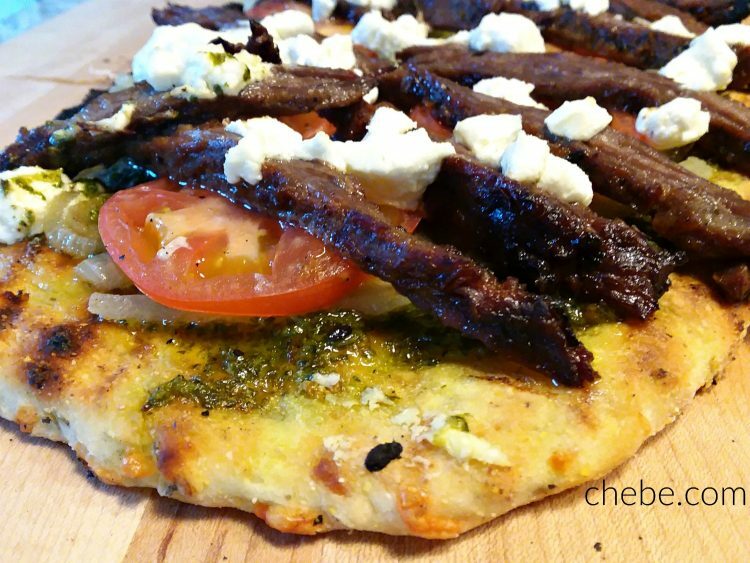 Remove from the grill onto the flat cutting board. Slice and serve. You may use any steak that is good for grilling. *For an egg-free version, use 6 Tbsp aquafaba. Re. the indirect heating method, turn off the center burner(s) if using a 3 or 4 burner grill, and turn off the side burner if using a 2 burner grill. If using charcoal, push the coals to one side.